Възползвайте се от невероятна цена за Best Western Plus Sundial - с оценка 8.7, дадена от скорошни гости. Location, cleanliness, staff, spaciousness of the room. The hotel was clean. The staff were friendly. The continental breakfast was adequate. Staff are lovely. Allowed me to check in early and helped with recommendations for the local area which was great. I had a late flight on the day of my checkout and they made me feel welcome to use the pool after checkout which was a nice touch. This combined with the location and the included breakfast made this the perfect hotel for what I needed. Breakfast and coffee were great. The staff was super friendly. The rooms are so tight like a prison cell. The sink was in the bedroom. The door opens to the street. It was very noisy and we could not sleep. The value was absolutely not fair for such a two star motel! The room we stayed at was incredible. It was spacious, quiet and clean. The bed was really comfortable. The location was great as it was a short walk from downtown Scottsdale. The breakfast was reasonable quality. The breakfast was especially great- hot and fresh every morning. Highly recommend!!! The service, and the facilities, the building, the on-site laundry are all amazing. Dino and Sergio at the front desk are the most helpful people ever. I love the location, it's close to everything. It was walking distance to the old town and mall. The breakfast was good. My room had a spa tub and parking was good as well as access to the main road. Clean and cozy. Great location for an even better price. Едно от най-популярните ни места за настаняване в Скотсдейл.Situated within 7 km of Desert Botanical Gardens and 9 km of OdySea Aquarium, Best Western Plus Sundial in Scottsdale provides an outdoor swimming pool and rooms with free WiFi. Featuring a sun terrace, this property is set a short distance from Old Town Scottsdale and Scottsdale Center for the Performing Arts. 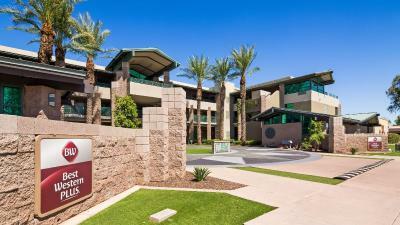 The property is 2.4 km from Scottsdale Stadium and 7 km from Desert Botanical Garden. The units in the hotel are equipped with a flat-screen TV with cable channels. Rooms are complete with a private bathroom fitted with free toiletries, while certain rooms at Best Western Plus Sundial also offer a balcony. The rooms at the accommodation have air conditioning and a desk. The wellness area at Best Western Plus Sundial is comprised of a hot tub and a fitness centre. Big Surf Waterpark Tempe is 8 km from the hotel, while Salt River Fields at Talking Stick is 9 km from the property. Scottsdale Airport is 15 km away. Това място за настаняване е оценено и като най-изгодно в Скотсдейл! Гостите получават повече за парите си, в сравнение с подобни места за настаняване в града. Best Western Plus Sundial посреща гости на Booking.com от 16 февр. 2011 г..
Кога бихте искали да отседнете в Best Western Plus Sundial? Тази стая с двойно легло разполага с климатик и плоскоекранен телевизор. Този суит разполага с балкон, климатик и хидромасажна вана. This double room features a cable TV, spa bath and air conditioning. Тази стая за 4 души разполага с телевизор с плосък екран и климатик. Важна информация Best Western Plus Sundial приема специални заявки. Добавете ги в следващата стъпка! Best Western Plus Sundial приема тези карти и си запазва правото да блокира суми от вашата карта преди пристигането ви.